"Why leave home? We'll bring the gym to you!" Click Here for a Free Consultation With an In-home Personal Trainer!!! Too busy to go to the gym? 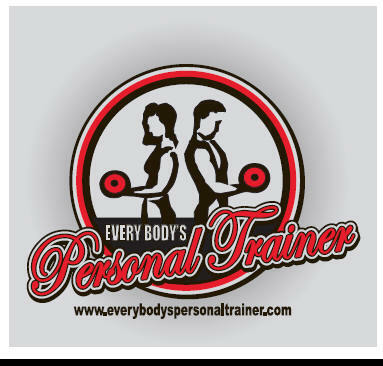 With Every Body's Personal Trainer, the gym comes to you! We know how busy you are. Our in-home personal trainers in Maryland, Virginia, and Pennsylvania will come to your home or office, with all the equipment you need to get a challenging total-body workout. Our fitness instructors will design workouts that will get you on your way to achieving your goals, without your leaving your front door. Can our personal trainers work with your schedule? Absolutely! Your personal training appointments will be scheduled at times that are convenient for you, when you can be free of distraction, and when you feel that you can be at your best for your workout. Our in-home personal trainers will be there for you rain or shine ready to give you a great workout. Our fitness staff offers constant support and will be with you every step of the way. At Every Body's PT, we take a your goal is our goal approach. Our coaches can meet you early in the morning, all the way up to late at night. Most of our training staff also is available for weekend sessions. Our staff will do everything they can to mold their schedules to yours. No matter what your schedule, we can be there! 1.) Intensity, intensity, intensity! To get results, your body needs stimulation to make the adaptations to get you those results you seek. The body needs to be stimulated, it needs intensity to make it reinvent itself and change. Although we try, it's very hard sometimes to train with high intensity by yourself. Have a trainer to work with will help you reach that higher intensity level, and allow you to get those results quicker and easier. 2.) The encouragement received from an in-home personal trainer is very motivating. Let's face it, working out can be tough, and sometimes boring. Our fitness pros will be with you every step of the way, encouraging and motivating you to achieve your goals. Do you find yourself too tired to workout sometimes, let our trainers use their energy and enthusiasm to help you through those tough workouts. 3.) Our personal trainers in Maryland, Virginia, D.C., and Pennsylvania will give you accountability! Do you find that you are missing workouts? The gym isn't going to call you and ask where you are. With an in-home personal trainer, you have an appointment. Our fitness pros will be there regardless, no more excuses not to get your workouts completed. We'll motivate and give you accountability. 4.) The knowledge of the trainers is very beneficial. How often do you find yourself wondering what to do and where to start? Let our staff take all of the guesswork away, thus preventing wasted time. 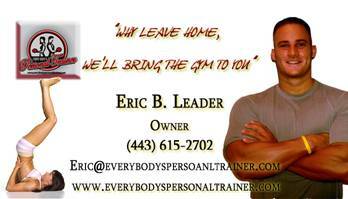 As the owner of the company, and a personal trainer himself, Eric Leader has taken it upon himself to hire only the best of the best. 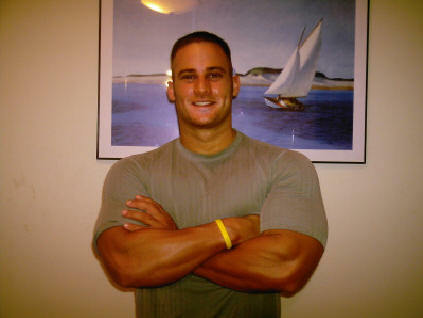 He has hand-picked the best fitness professionals, with the highest degrees and certifications in the field. 5.) Safety, and learning to use correct form while performing exercises. Preventing injury is extremely important, learn how to use correct form and workout safely. 6.) Constant support. Any time you need us, we are just a phone call away. It doesn't matter day or night, we are here to support you in achieving your goals. Call us from the grocery store, from the hotel, it doesn't matter. We are here. Our clients are also our friends, and your goal is our goal. We will do anything we possibly can to see that you reach your goals. 7.) Programs are tailored to the client's specific needs and wants. Everyone has a different goal and starting point. Our fitness professionals will write a program specifically targeting your individual needs. Our programs will assess not only your fitness regimen but your diet as well. No matter what the fitness level or background, we have the programs to suit your needs. 8.) With an in-home personal trainer, results come a lot quicker. No more missed workouts and ineffective routines. Our staff will write a fitness and diet program for you, and be there with you to execute it. We'll keep you consistent with your workouts and diet thus yielding great results. 9.) Having a coach prevents against wasted time in the gym trying to achieve goals. Why waste time looking at the machines trying to figure out how to use them? Our fitness pros will write a program specifically targeting your goals, and be there every step of the way to execute the plan. In addition, our fitness staff will perform fitness evaluations measuring body fat, circumferences, and strength and endurance. These evaluations help to ensure that you are on the right path towards achieving your goals. 10.) It's fun! Our staff will use their creativity to make working out fun, not just a chore. We'll take you outside, to a track, or even use boxing, in order to keep you excited about your program and working out. Let's face it, if it's not fun, you are not going to want to do it, and stick to it. Part of what makes a great trainer is creativity along with effectiveness. We know you'll enjoy your workouts with our trainers. What are clients saying about our trainers? Brian is the best trainer I have ever worked with. I have had so many trainers in the past, and he is by far and away the best I have worked with. Thanks so much, Eric, for finding me such a good fit. You can trust Eric to match you up with an excellent trainer. Being in the industry, he knows what he is doing. Learning how to resistance train was my goal, especially learning proper form without injuring myself. My trainer shows me the proper technique and is there to spot and help me through the movements to perform them effectively. I have seen a major difference not only in strength, but in tone, and I am really happy with the results. Working with a trainer has really helped me very much. Lacking energy, and motivation, I knew I was going down the wrong path. I had gained so much weight and was beginning to feel like I was a lost cause. I knew that I had to do something, but I needed a kick start. Having an in home trainer meet me at my home was the best option. I could come home and get my workouts done with a professional, and my trainer gives me the accountability and motivation that I needed. A very good service that I highly recommend. Warm weather is around the corner, so it's time to shake off the winter blues, and get my diet and exercise in gear. I'm ready for some tough workouts and disciplined dieting, bring on the sun! Hey guys, I'm training harder than ever with my trainer and feel like I am gaining lean muscle and losing body fat. My strength gains have been great, and I feel like my body is changing in a positive direction. Thanks for all the help and guidance and I look forward to working further with your program. The holiday season is here and I always gain weight. So this year I went with a trainer, and he's whipping me into the greatest shape of my life. Every workout is awesome and I actually enjoy them. Thanks for the great service too. My trainer is the best! She always mixes up our routines to keep me from becoming bored, and sometimes we even incorporate my pool in our activities. Working with a professional is a fun and exciting way to not only get results but to make exercising fun again. I don't feel like I am working out with a stranger, I feel like I am working out with my friend! After a bout with illness, I became so out of shape and unmotivated to workout. I had gained weight, and all of the previous muscle tone I had, seemed to have faded away. I needed someone to help kick start my desire to get back into shape again. A personal trainer was the ticket. The regular workouts and motivation were really what I needed. I am very thankful to be able to train again and to finally get back to good health! It's been a month and a half, and I have noticed good improvement in regards to energy, lean muscle, and fat loss. My overall health also seems better as well as my mental state of health. I know you said three months, but I can definitely feel the difference already. Looking forward to seeing and feeling how much more my body will change. Okay, New Year's isn't here yet, but I'm not waiting. I have the trainer, the plan, and I'm ready. This is going to be the year, and I can't wait to see what I accomplish. Thanks for the great customer service by the way. Just wanted to keep you posted on my results. Yesterday, I got 275 for 9 on the flat, and 225 for 7 incline, I definitely feel that my strength is improving. Also, I ran/walked 3 laps at the track, my cardio is feeling better to. Thanks so much for your help! Just wanted to send a quick thanks for sending Richard Ghoneim as the trainer for my son Robby. He has been GREAT and a BIG change. I hope we can continue to have Richard work with Robby during the school year. Thank you. Thank you. Thank you. Tiffany was the right choice. We are totally psyched that she comes with the range of knowledge re: nutrition, body type, stability, exercise, etc. Her well-rounded approach will definitely work for us. I thank you again for going the extra mile. We look forward to the work! As of 3 weeks ago, I was down to 170 which was 10 lbs lost. I have a feeling I've lost at least 5 more...I'll let you know. But, the biggest change are the inches and clothes sizes I've dropped...and I have muscles now! bust area 38" -- lost 3.5"
bicep 12 -- lost 1"
waist 32" -- lost 6"
hips 41" -- lost 6"
thigh 23.5" -- lost 3.5"
Eric, regardless if I win the body transformation contest or not, I cannot thank you AND ADAM enough...I feel so much better and I look so much better!!! I have energy I never knew I had and am really proud of myself for doing this for me and my good health. I will be a much more confident bride now. I have 1 more month and hope to continue the hard work. I have to admit, my husband pushed me into getting a trainer, but I am so glad he did! I was lacking self esteem, and insecure about how I looked. I needed to lose weight around my mid section and thighs, and my trainer has done a great job in helping me with that. I have so much more confidence now, and I can't wait until the summer to show off this new body. I just wanted to say Hi! and, let you know, what a fantastic job Beth is doing! I had a 2 week break cause I fell on my head (6 staples), and today is my first day back, but I am loving it, and am very excited about the future. Beth is so knowledgeable about the nutrition, and has helped me to get on track with my eating, by keeping a daily calorie count, increasing the amount of protein, fruits and vegetables, and decreasing the sweets. She is so familiar with and dedicated to the training program, and is helping me to learn how to do each exercise/stretch with the proper form. She is such a lovely lady, and is so personable, that this is a win-win situation for me! Thank you so much for recommending her; you were right on target with her skills and abilities matching the professional help I need. This is the first time, since 2003, that I have been able to do training instead of physical therapy. I can’t begin to tell you what a joy this is for me! My husband, Scott, also started training with Beth, and we both feel very blessed to be able to do this. Thank you for starting this business, and for making it so convenient for Beth to come to our home. We both wish you much success! I recently got promoted to essentially my dream job. The problem is that the job will require grueling hours from 6 or 7am to 5 or 6:30 pm. I know the only way I can do this job (including several months at a time over in the war zone) is to keep working with Nick at least three days a week. We have been meeting with Nick Monday, Wednesday, and Thursday at 6:30pm, and we asked him if there was any way he could find other times to meet with us. Nick is quite busy with other clients, white water rafting, and his bands I felt this was quite an imposition. He assured us he would find time and not to worry. (Well I still worried, its a bad habit I am trying to work on!) I was ecstatic when he told us today he worked things out with other clients and will be able to meet with us Monday, Wednesday, and Thursday from 7:30 to 8:30pm. Nick pushes us very hard, which is what we wanted. I now look forward to working out, and working out hard. I know if I go easy I only cheat myself (I have to remind Jack of that from time to time too!). Working with Nick makes it easier to work out when Nick is not there, which is a pleasant change from dreading it. Nick is polite, affable, professional yet easy going and fun to work with. The only time he was late was when traffic shut down a road both Jack and I had sat on too, and he called a head of time and insisted on staying late to make sure he made the full time. Again, this was completely out of his control but it would have been easy for him to rush off. Because of our good experience with Nick, Jack and I have concluded with the demands of our jobs right now it is paramount we continue to work out three times a week with Nick. My friend and I have been working out together as part of the "partner training" program. We weren't sure how it would work with two people training, but it has been so much fun. Our trainer is great, and we challenge each other and feed off each others energy. It's been such a wonderful experience. Our program is challenging, but the motivation that our trainer gives us has proven to be so valuable. April has been more than excellent for me and my 'special needs'. Know she was a good hire! Lucky, I has a treadmill, recumbent "bike" and other things, so I came with tools that helped me & with my situation however, April has been very, very good as a trainer. She only does what she knows I can handle. When I felt we could amp it up, she did - just enough. She's very realistic about things & helps you find way to learn about making better choices. She has been so good about my lack of good balance. She said at our consultation that I would see balance improvement faster than I thought. She was dead-on accurate and it's only been a month! I wanted to send you a quick hello and tell you how much I am enjoying my training and especially Amanda! Amanda is fabulous; I can’t begin to tell you how very impressed I am with her, her knowledge, her attitude and her energy. Amanda has made my work out fun and I even look forward to our training, and believe me that is saying a lot for me. Remember I’m the one who hates to exercise! Amanda has structured a comprehensive, diverse and fun work out for me, keeping in mind my age, lack of exercise and even my back issues. She’s a great instructor and she explains everything and if I have a problem with an exercise due to my back she immediately regroups and has me in a new exercise working the same area, but no back pain, that alone is a great talent and very appreciated. I am so glad that I contact you and your company and you found Amanda for me. Amanda is a keeper, truly a credit and an asset to your organization, I brag about her and your company to my friends, family and co-workers all the time. Amy Smullian lost 34 pounds & 15% body fat! Our personal trainers, at Every Body's Personal Trainer, are available for in home personal training at all of the above locations. Have one of Maryland, Pennsylvania, and Virginia's best personal trainers work with you in the comfort of your own home. Our fitness pros in MD, PA, DC, FL, NJ, and VA, will bring the equipment necessary to give you a great total body workout in the convenience of your home. Give us a call today to get started on your path to achieving your goals with one of our in home trainers in Maryland, Pennsylvania, Florida, New Jersey, Washington DC, and Virginia. We'd love for you to take advantage of our free, no obligation, consultation. We sincerely feel that our staff can help you achieve your goals, but we want to prove it and earn your business. We take our customer service very seriously, and never take our clients for granted. If you have any thoughts or concerns on how we can improve our service, we would love to hear from you. We are constantly striving to improve and offer the best personal training services in the area, and we would love to hear what you have to say. On behalf of our training staff at Every Body's Personal Trainer, I only have one question for you. "Why leave home, we'll bring the gym to you!" If you are ready to get started, you can call us anytime at (443) 615-2702. If you'd like to email us with your goals and contact information, you can email us at eric@everybodyspersonaltrainer.com. We look forward to hearing from you, and helping you achieve your goals.